Tractebel Power's Ripon Cogeneration in California at the Fox River paper plant is producing 20% more hot day power with a new inlet air cooling system. The STIG LM5000 plant normally generated 42 MW of power at summer day 101F inlet air temperature and now produces approximately 50MW at the same ambient with inlet cooling producing 45F inlet air temperature. Inlet chilling startup date was mid-May 1997. System was designed by Kohlenberger-KACE Energy Corporation using York International refrigeration equipment. Design uses multi-temperature, cascaded cooling coils, each dedicated to separate refrigeration temperatures. The technique cools down the inlet air in a series of cooling stages. This is said to maximize the thermodynamic effect and efficiency by cooling the air in steps, using refrigerant at progressively lower temperatures. The multistage system is designed to enhanced performance for continuous base load installations, as well as for selected peaking applications. The system has shown to increase net power output by 15 to 25%, while reducing heat rates by 3 to 5%, depending on the particular gas turbine. Company is marketing the equipment as Gas Turbine Inlet Air Cooling (GTIAC) in different size ranges to fit different gas turbine makes and models. 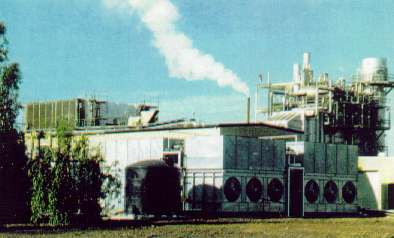 Ripon Cogeneration. STIG LM5000 in California is getting a 20% hot day power boost with mechanical refrigeration inlet cooling system. For the Ripon site, the refrigeration capacity is nominally 2000 tons ammonia refrigerant with an air cooling capacity of 300,000 cfm from 101F ot 42F at the gas turbine inlet. Major refrigeration equipment at the site (from York/Frick/Imeco/Frigid Coil) includes two 700-hp compressors, three evaporative condensers, two 72-inch refrigeration recirculators, four 500-ton, two-temperature/staged/cascaded cooling coils. The IHI STIG LM5000 was first delivered to site in 1988 and started operation at the Simpson Paper Company Ripon Mill later that year. In full STIG operation, at ISO base load, the gas turbine is rated 69,750 shp (52MW) with design 44% thermal efficiency burning natural gas fuel. Tractebel recently took over the cogen plant. See Pictures of the installation of the GTIAC system.